Matriculation morning the knobs and their families report to the Holliday Alumni center early to receive their company assignments. Across the country high school seniors are graduating. In the South the graduations have already begun. In the North June tends to be graduation month. 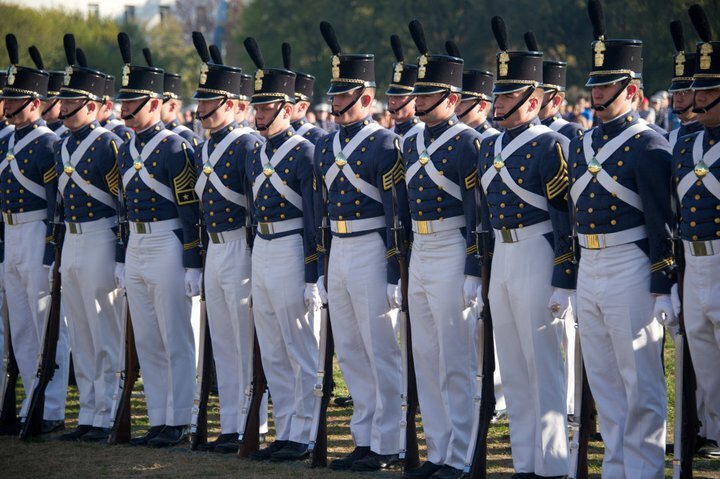 That means families getting their students ready for Matriculation Day at The Citadel are turning their focus to getting things for their soon-to-be Knob. The school will post an updated list of items the new students are required to have. (you can view the previous year’s information on page 6 of this document. it changes very little from year to year.) The Citadel Family Association also has a list of items that families have found helpful to have. It is called the “Nice to Have List.” You do not need everything on the Nice to Have List. Parents should ask their student what they would like from that list since they will be the ones to go through the 4th Class System. I will pause here to give a word of advice to parents. Your student will be attending a leadership school. I’ve written previously about what I learned about what that means. The hardest, but most regarding lesson for parents of cadets is this, your student will have to be the one to navigate the rules and regulations of the school. You can help them get ready to report, but once they are on campus the students are the ones who must take control of their process. Your role will move from one of guiding and teaching your child, to the role of encourager and support person. You WILL NOT be able to navigate the system for them day to day. This first year is a rollercoaster of emotions for the knobs. My advice to parents is to avoid getting on that rollercoaster with your student. Obviously you will be concerned, but try to remember that the challenges your student will encounter are learning experiences for them. You will be the only one they can confide in and vent to this next year. Often times the knobs will vent to a parent, leaving the parent worried, while the knob moves on and never tells the parent they’ve resolved the issue. In the next several months local alumni groups sponsor “Send Off events” for incoming knobs and their families. You can check with the Citadel Alumni Association to see if the club in your area will host an event. The Citadel Family Association also has area reps who are current parents who volunteer to help the new parents. you can find a list of the Area Reps here. The Atlanta Citadel Club has asked me to serve as the chair of the new Parent Committee. We will have a parent orientation meeting in June then the club will host a send off event August 4. Contact me if you’d like additional information. Make sure you can meet, or better yet, exceed the Physical Training requirements. Buy and wear your black plain toe Oxford shoes (MUST be Polishable leather) and your 8″ desert boots. Now through May 28 you can get 35% off site wide when you use the promo code EXTRA35. Begin to memorize the Knob Knowledge in the Guidon. It is available online or in the bookstore. You’ll get a copy when you report. Parents often wonder about company assignments and roommates. The majority of cadets will find out their company and roommate on Matriculation Day. The athletes who report in July will all stay in the same barracks then move to their regular company assignments in August when the Corps of Cadets report. Unlike other colleges cadets will change rooms through out the year. The moves can be for a variety of reasons. If you live out of state and don’t want to ship the items to campus, you can order times from Bed, Bath and Beyond or Wal-Mart and pick them up from the stores in Charleston. If you choose this option you will have to arrive in town before Matriculation Day. If you ship items to campus it is a good idea to arrive Friday morning to retrieve them from the warehouse on campus. Contact the warehouse directly with any questions about shipping items in advance. I know it is a very stressful time for parents who do not have a military background or do not have a history with The Citadel. I was in your place in 2007. Much of what happens seems really strange. As my son would tell me every time I would question something, “There is a reason behind everything we do.” It is the knobs challenge to learn these reasons. A parent needs to encourage and support them in the process. In just a few more days the Class of 2019 will report to The Citadel for Matriculation Day. The nerves of the future knobs are probably running pretty high right now. If you notice your son or daughter withdrawing a bit, and being a little more quiet than normal don’t worry. Just like athletes who withdraw to get mentally ready for the big game, future knobs begin their own pre-game ritual. Parents begin to feel a bit nervous too. Allow yourself to feel these feelings Sending a child off to college is a big transition. Sending them to a military college is even tougher. It is important that the future knob take ownership in getting everything together before Matriculation Day. Once their families say good-bye Saturday morning it is the knob who must navigate the 4th Class system while family and friends move to a support role. Before reporting in make sure you’ve packed everything on the Success packet list, on page 6 and 7, and what they want to bring from the Citadel Family Association’s Nice to have List. Each year someone forgets their wallet and ID (Driver’s license). Be sure to add that to your packing check list. Be sure to pack in containers so that one person can easily carry each of them. Some families use disposable boxes and bags in addition to the 2 plastic bins so the knob will not have to go to the storage warehouse. Each family makes their own plans to get to campus on either Friday or just Saturday. There are some meetings that are good to attend on Friday if you can be in town. The Army ROTC cadets have a meeting Friday afternoon. A few families have decided to meet at the canteen for lunch on Friday at 11:30 before the meeting. If you are on campus then stop by. The canteen is in the Mark Clark Hall building. The same building that houses the Bookstore and the post office. Other groups have their own special meetings. If these gathering apply to you and your student you would have gotten an invitation/notice. Many families take the opportunity to go out for a nice dinner the night before the student reports in. Charleston is noted for wonderful restaurants. The Charleston Convention and Visitors Bureau has a guide if you need help deciding where to go for dinner. If you are staying in a local hotel chances are several other families will be there too. I encourage families to say hello to other families that look like they have a college freshman aged student with them. Chances are they will be future classmates. Saturday morning be sure your student has a good breakfast then get to the Holliday Alumni Center by 7:00 am. The soon to be knob should wear their white crew socks(ankle socks for the Class of 2020), athletic shoes, shorts/pants and a shirt (ticked in). The first thing they will do once they get to their barracks is change into their “knobbie clothes.” If they already have the socks and sneakers on it is just easier. It is also a good idea to say your real good-byes at the hotel. Things move pretty quickly once you get to campus. Some families find it helpful to do a dry run from the hotel the night before. If it rains Saturday morning allow extra time to get to the campus. Charleston roads do flood when it rains. The traffic diagram is on the Matriculation Information page of the Office of the Commandant page online. You will visit the Office of the Commandant page all four years so you may want to bookmark it in your computer. Print out and bring the Traffic Diagram, FERPA form that must be completed and signed by the student, and the schedule for the day. 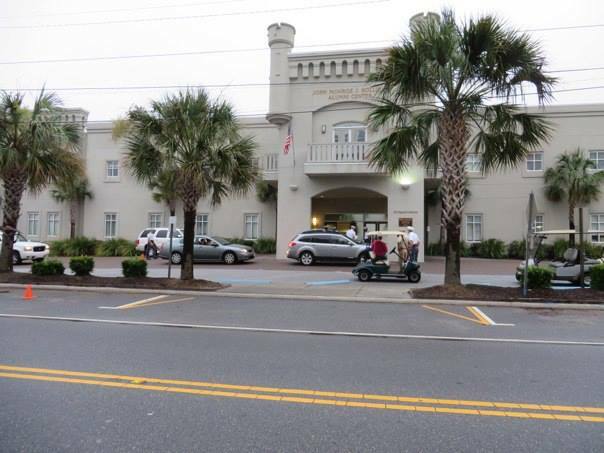 Once you arrive at the Holliday Alumni Center you’ll drive up in your car and the cadets there will give you the letter for your son or daughter’s company. Follow the map to the appropriate barracks. You’ll be instructed by the “Blue Shirt” volunteers and cadets at the barracks where to unload the car and put the things. You’ll also be told where to move your car. The Blue Shirt volunteers are parents of current cadets who volunteer to help the new families each year. Some travel quite a distance just to help out on this big day. Once outside the barracks your son or daughter will be told what to do. Usually they report to the admissions representative at a table in the sallyport (entry way to the barracks). This is when the parents, and anyone with the families, just wait. Bring a folding chair with you if someone in your party has trouble standing for long periods of time. Once inside the barracks the cadet recruit will follow directions. They will eventually come out and let you know when it is alright to carry their things to their room. Once everything is in the room the parents and family leave. Do take time to get a photo of all of you either outside the barracks or inside the room. You’ll cherish them. Parent must leave the barracks by 10:00am. Once the parents leave the gates of the sallyport will close and the introduction of the cadre will begin. This can be a very tough things for some families to watch because it signifies the beginning of a week long period when you will not hear form your son or daughter. It is best to move onto the fieldhouse for the information fair and president’s address. There is an information fair in the McAlister Fieldhouse right next to 1st Battalion. It is good to go by there and visit the various tables. 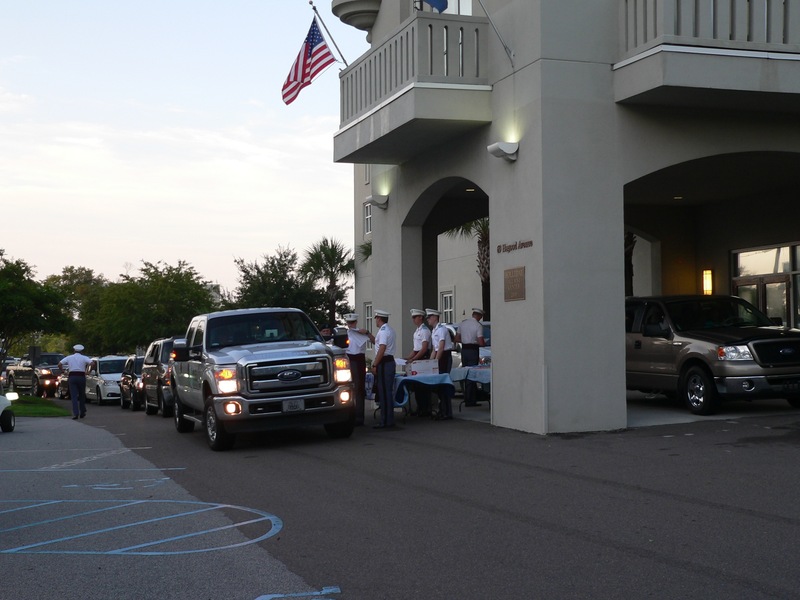 The Citadel Family Association will have representatives there serving some refreshments to. It is air conditioned, there are restrooms and you can have a seat for the President’s Address. Once the address is over you are free to leave the campus. Some families stay Saturday night. Others want to go straight home. If you are in town Sunday you can attend the Sunday morning chapel service. You will not see or be able to talk to your son or daughter. Many families find they enjoy the time in the chapel after a stressful day Saturday. Monday evening is when the knobs take their cadet oath. The past several years the school has provided a live stream of the event online. Watch the school web site to see if they will do it again this year. It is not an event to stay for. It begins at 7:00 pm and only lasts 15 minutes or so. You won’t be able to talk to your son or daughter. Many local parents who stayed said they couldn’t tell where their child was. They have their hair cut and all in the same uniform. Once you know your child’s company, reach out to the CFA company rep. you can find a list on their website. If you haven’t already, join the Facebook group for 2019 parents. I ask that you send me a private message on Facebook or an email to verify that you are a parent before I will confirm your request to join the group. The group is a great way to share photos and get information on the big weekends and events on campus. Citadel Family Association, “Blue Shirt” volunteers wait with parents of the Class of 2015. The Bravo Co. cadre lead the Class of 2014 to lunch on Matriculation Day. Class of 2015 knobs head to lunch on Matriculation Day.